We offer a number of Special Tours or add on activities to ensure our guests maximise their experience in Wadi Rum. Our particular focus is on the ancient petroglyphs and inscriptions in the area and exclusively offer tours with a local knowledgeable guide who has worked with various groups who have worked identifying, preserving and documenting these precious landmarks. 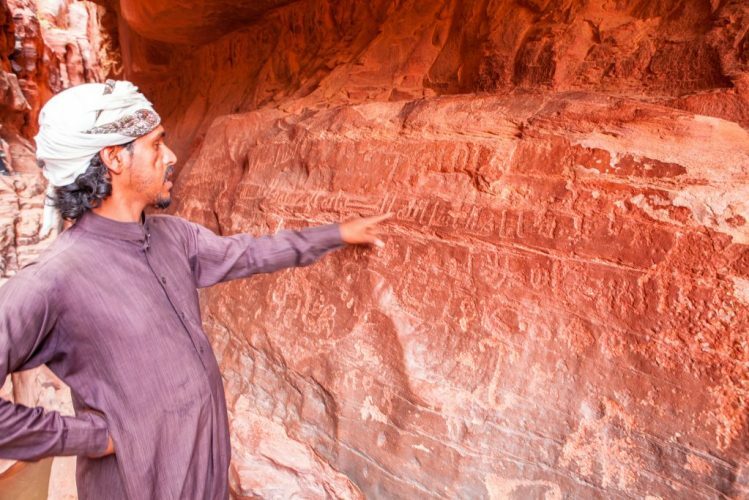 We offer exclusive tours with detailed explanations of the petroglyphs of Wadi Rum, the various rock art in the area is attributed to the Thamud people groups who inhabited the region pre-christ. The area has over 20,000 petroglyphs and an additional 20,000 inscriptions. The Thamud people, part of the Nabatean Kingdom who are famous for their rock hewn tombs including Petra and other cities in the region, made most of their inscriptions 2400 years ago, slightly before the creation of Petra. The petroglyphs of this period include humans, horses, camels, ibex including scenes that appear to depict hunting practices. Additionally there are a number of inscriptions of both the Thamudic alphabet and the Nabatean alphabet. Additionally there is also more recent evidence of Roman, Hebrew, Ottoman and Arabic engravings bringing to life an area that sat at the limits of many of the greatest empires that ever existed including the Egyptian, Assyrian, Babylonian, Persian, Greek, Roman, Arab, Seljuks, Ottoman and English. Our guide is experienced with identifying and preserving the rock art in the region, you will have the opportunity to see the most impressive and well preserved markings and will be provided with explanations of the interpretations of each image. Additionally you will receive explanations of how to identify and age the different engravings and get some simple understanding of the techniques that were used to make the engravings.